Out of the 549 movies released in the US last year, only one will go home with the Academy Award for Best Picture. But that doesn’t mean the other 548 don’t have something to teach us. 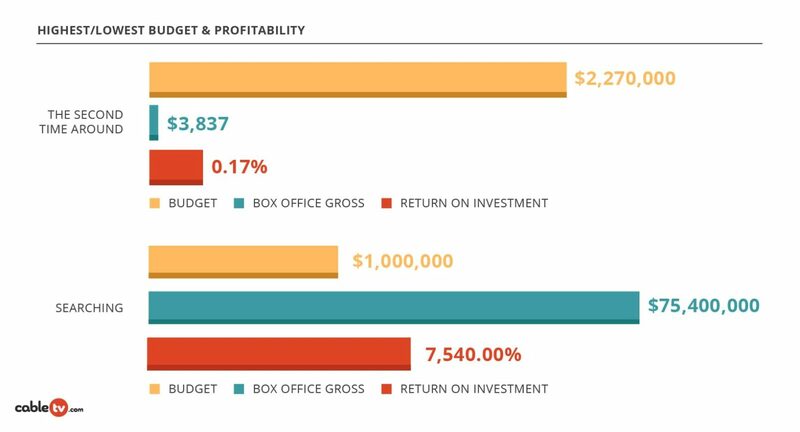 That’s why we’ve crafted a comprehensive overview of everything movies, from box office earnings to wage gaps and beyond. Our list of 2018 movies, along with their budgets and box office grosses, came from Box Office Mojo. Tightening our focus a bit, we tossed out titles that weren’t released in the US. We gathered review scores from Rotten Tomatoes and Metacritic, and we picked up a couple extra stat things from other sources we’ll mention below. 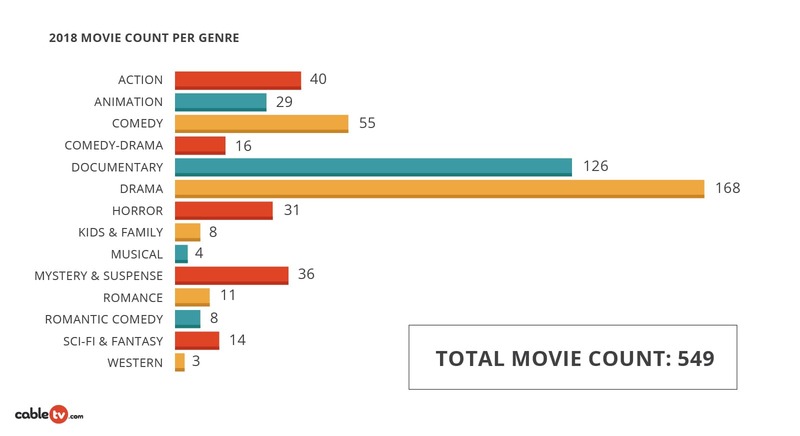 Dramas represented three of every 10 movies, while westerns are dust in the wind at this point. Action movies were stars of the box office, but horror films lurked five steps behind, picking up all the ROI. Apparently, horror works best if you don’t see the monster, which means you can save on CGI costs. In a Magnificent Seven-style win, critics loved the three western movies of 2018. But audiences were most likely to adore one of the four musicals. Numbers are a tricky thing. See, George Clooney was the highest paid actor in 2018, but he made exactly $0 of that from acting. Instead, he sold his tequila company for $1 billion. The highest paid actor for acting was Dwayne Johnson, whose $124 million earnings landed him the record for highest-ever total acting earnings in one year. 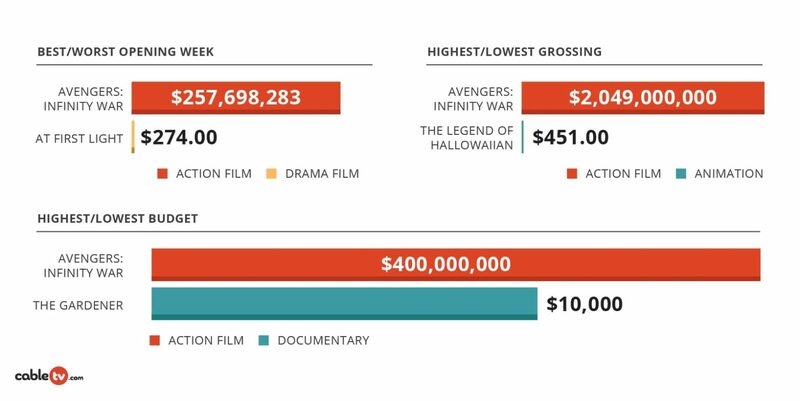 Meanwhile, Avengers: Infinity War had the highest budget, but it also swept the highest grossing movie and best opening week. Got to spend money to make money, right? And love might be lovelier the second time around, but not so much for romance The Second Time Around. The film snagged awards during its 2016 festival circuit, but the 2018 US release didn’t see much return on its $2 million budget. Meanwhile, Searching proved small budget films can have tremendous success. 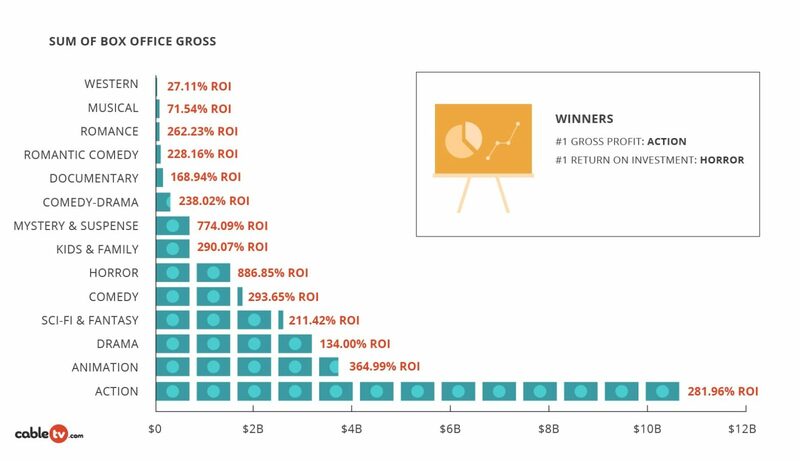 The thriller also premiered at a film festival but ended up with a 7,450% ROI. 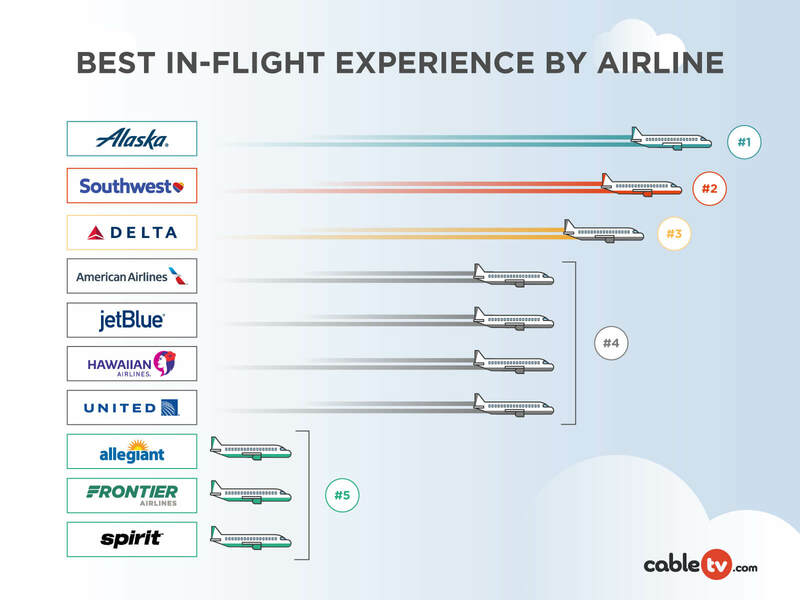 Not shabby for a movie set on computer and smartphone screens. 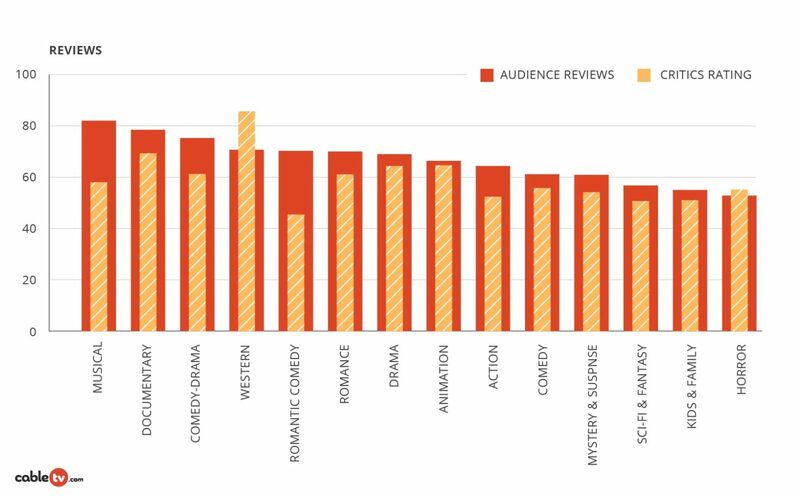 We’ve established that America loves action movies—but that love doesn’t stop at the box office. 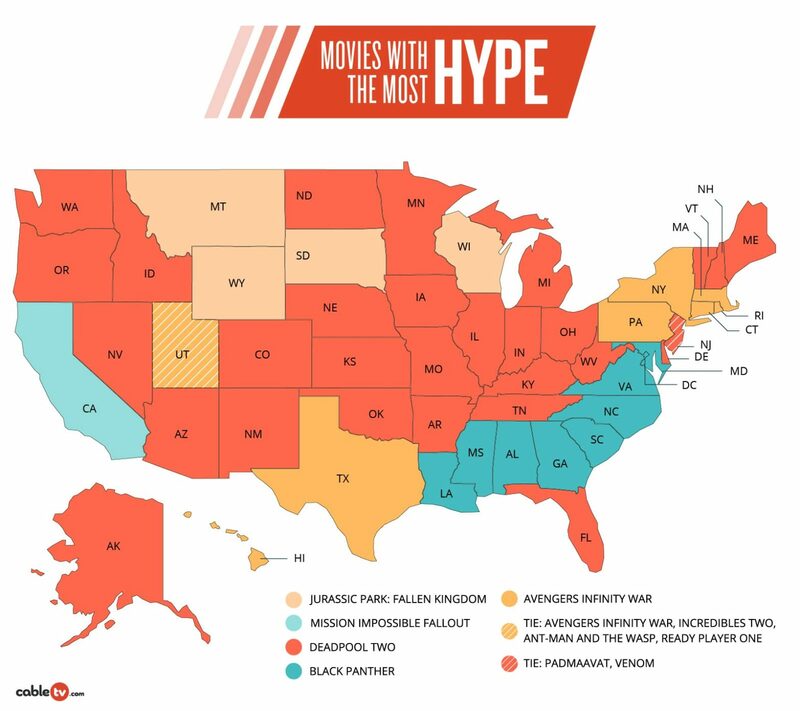 Fans have been googling upcoming movies all year, and we used Google Trends data to see what each state was most excited about. Deadpool sliced his way back into our hearts with Deadpool 2. It was successful enough 21st Century Fox thought it could get away with rehashing it into a PG-13 movie, Once Upon a Deadpool. That didn’t go over so well. When you look at the map below, your eyes might be drawn to the beautiful aqua belt along the Eastern shoreline. Audiences here were stoked to see Avenger T’challa rule in his movie, The Black Panther. Wakanda forever. And though it’s the sixth movie in a series, Mission: Impossible – Fallout maintained it’s charm. Californians still aren’t tired of watching Tom Cruise run fast. The gender question is always a tricky one, so we’ll stick to the numbers here. If you were to take nine movies at random, chances are two would have no designated lead, three would have a female lead, and four would have a male lead. 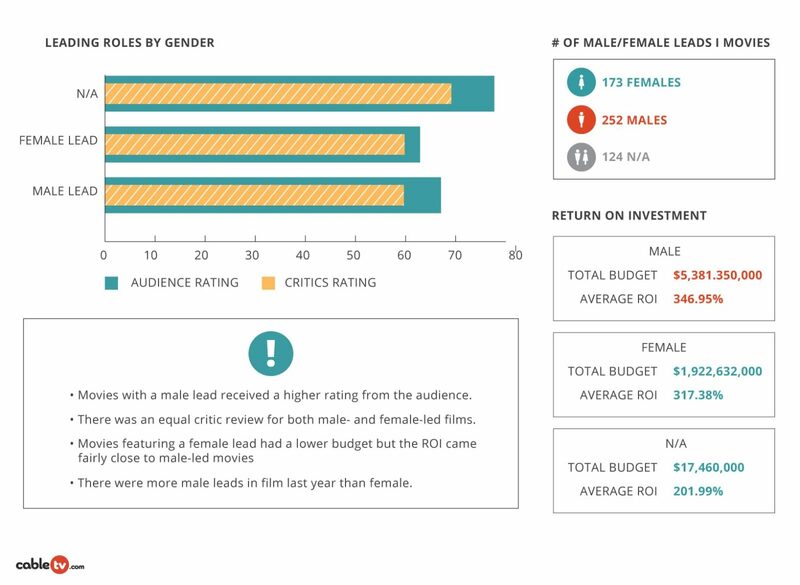 Movies with a female lead had 9% less ROI than movies with a male lead, while films with no designated lead saw 42% less. Often critics fawn over movies that viewers want nothing to do with—and vice versa. 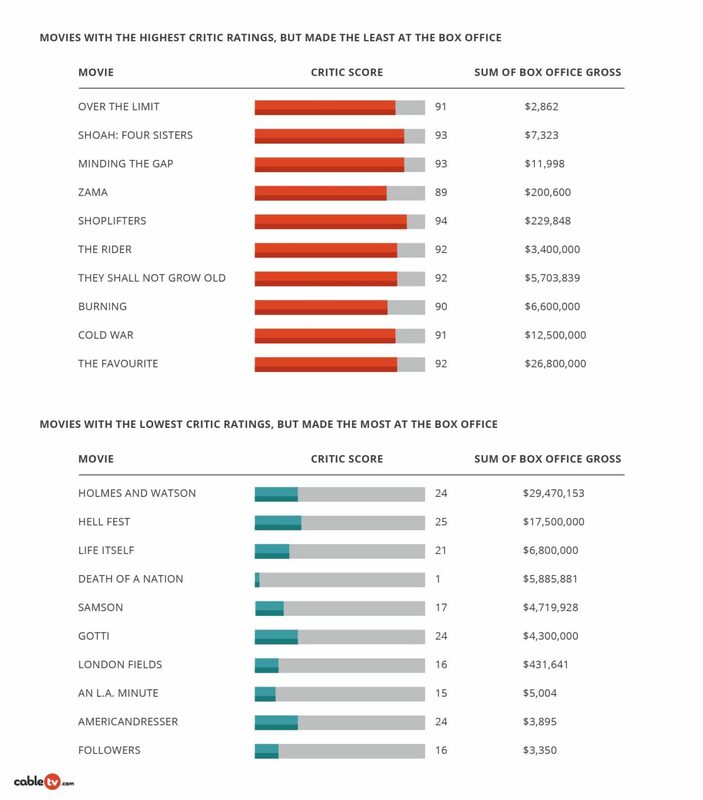 Looking at films critics loved, we gathered the ten with the lowest box office gross. Unless you’re a big art film buff, you probably haven’t seen these yet. But you’ve probably heard of a couple Oscar winners on this list—Peter Jackson directed They Shall Not Grow Old, and Emma Stone was a lead in The Favourite. The money-making films that critics hated cover a more full spread of genres than the dramas and documentaries they loved. Horror, action, drama, documentary, and mystery—it’s hard to find anything that missed their ire. 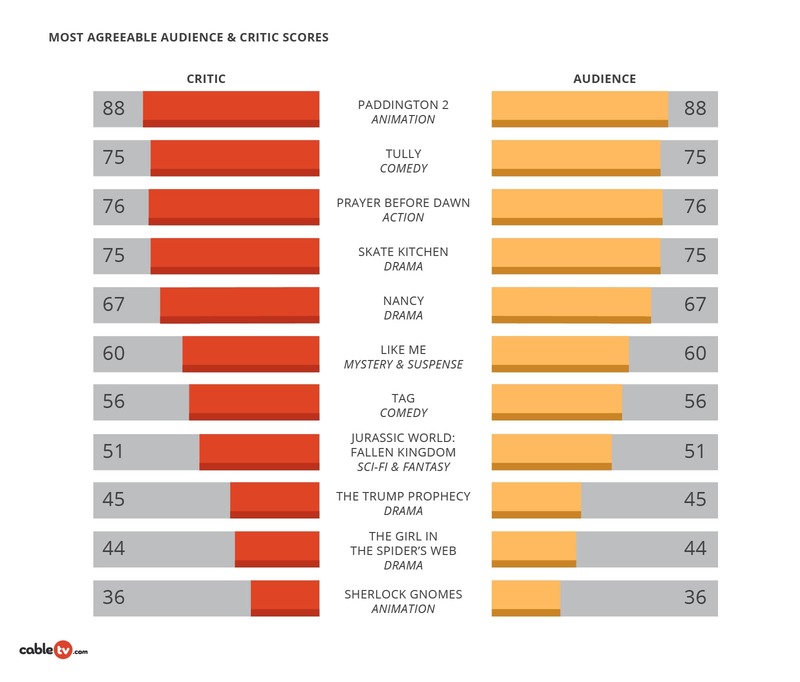 But there was one film critics couldn’t say enough bad things about that audiences loved. Critics called “fake news” on Death of a Nation, while Trump supporters were ecstatic to have someone tell their side of the story. It’s a very politically charged situation. We’re a simple cable TV website. So, um! Paddington 2—everyone likes a bear in a blue duffle coat. Isn’t that something? Below are the 11 movies critics and audiences agreed on. And we can all agree that Sherlock Gnomes never should have left his garden. There were a lot of great movies—and plenty of flops—in 2018. Give us your predictions for the Oscars in the comments below.